Since the iconic H&H Bagels served its last smear years ago, New York noshers are still mourning its loss. Luckily for uptown eaters, listing every bagel spot in Upper Manhattan would be a (delicious) mouthful. For a classic local food in a quintessentially New York City area, stop by one of these uptown bagel spots. Follow the long line of West Side snackers to Absolute Bagels, a city staple for any carb connoisseur. This uptown noshery, known as much for its weekend crowds as its standout bagels and schmears, including pimento-olive and perfectly fatty salmon, is a must-visit for fans of the classics. Something of a food desert, Washington Heights is the last place you’d expect to encounter an old-school New York bagel shop, yet that’s just what you’ll find in Mike’s Bagels. Keeping it classic, Mike’s fresh, chewy bagels (each of which will run you just $1) come topped with a generous smear of cream cheese, add-ons such as Nova salmon and pastrami, and, because it’s New York, a palatable dose of brash customer service. Where better to enjoy a traditional New York food than at the city’s most classic shop? 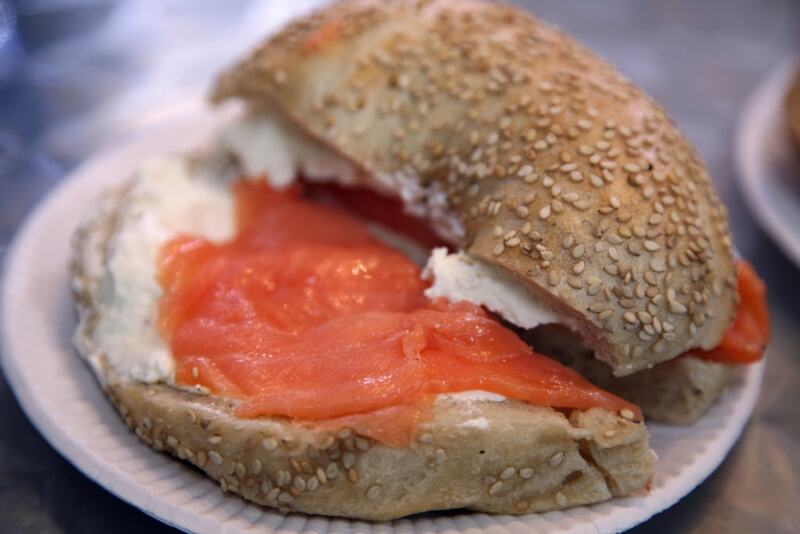 At Jewish emporium Zabar’s, you’ll find plenty more to love than lox alone. Here, New York Kosher bagels are made with malt barley flour before being boiled and baked in-house. Snag one (or more) with fresh whitefish salad or smoked salmon schmear for a timeless taste of Old New York—and your new breakfast go-to. Originally brought to you by the same team behind the dearly departed H&H Bagels (though now under different management), this Upper East Side spot will fill the H&H-shaped hole in your heart—or stomach. At H&H Midtown Bagels East, the recipe (and the customer satisfaction rate) hasn’t changed since 1974. The nearly 20 bagel varieties and 15 toppings, including sable, belly lox, and scallion schmear, continue to satisfy longtime fans while reeling in new ones. With the recent opening of BO’s Bagels, Harlem has further solidified its status as the New York foodie’s best-kept secret. Here, bagels in standout flavors such as Black Russian and blueberry (made with real berries and no sugar) are prepared in small batches in BO’s open kitchen, providing customers with breakfast and a show. Tip: Heed the shop’s invite to “car-BO-load” early as this mainstay in the making tends to sell out fast. Since 1908, Barney Greengrass has been the Upper West Sider’s pick for Jewish-style fish. 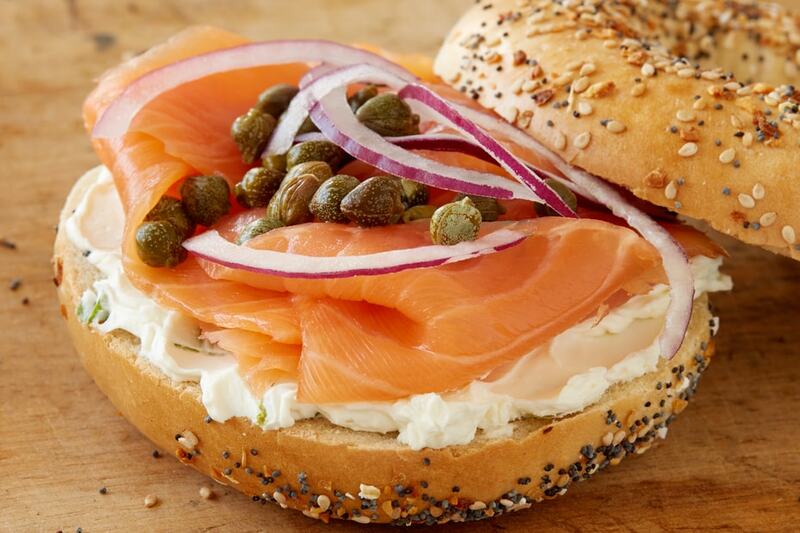 Enjoy your catch atop a freshly baked bagel, the ideal vessel for sturgeon, Nova Scotia salmon with Swiss cheese, sable, and more of Barney’s bagel sandwich specialties. A “cheat day” destination if ever there was one, the calorie-championing Bagelworks offers a refreshing respite from pervasive foodie health fads. Here, freshly boiled bagels are served slathered with homemade cream cheeses, such as bacon-cheddar and blue cheese-parsley. For those looking to gorge without sacrificing their health goals, even Bagelworks’ low-fat and tofu-based spreads taste like you’re dining decadently. The only thing sweeter than the deals at Inwood Bagels (think a dozen bagels for $10) is its customer service. Free samples and a friendly staff get you in the door here, while fresh bagels, unique cream cheeses, and top-quality coffee (sadly, not always a given at the city’s bagel spots) will keep you coming back day after day.